Why Is Today's Art So Meaningless? "Art has been defined over and over as man's highest spiritual expression, superior even to religion in that it is the only human activity that does not lead to killing." So said Jacques Barzun. But art is not without its own victims. We are familiar now with the evolution of cultural revolutions and their adherents. In the beginning, there was the Christian revolution, where Christian ascetics achieved fame by extravagant feats. Historian Paul Johnson describes one who "devised a cell which forced him to live doubled up," another who "spent 10 years in a cage shaped like a wheel." Some of these devotees went completely naked. The most famous one, Simeon the Stylite, spent 36 years standing on a 50-foot column. A church was built over his grave and the column, the remnants of which you can still see in Syria today (better visit right away before ISIS finishes them off). Wasn't Simeon a great performance artist? Just like the contemporary artist who lived on a shelf in a gallery for weeks, or the woman sleeping a glass box in a museum, or the woman who stared at gallery visitors for hours? Such acts must be torturous, but they serve a higher purpose. Christianity has taken the road from the scorched Syrian desert to the opulence of the Vatican. Modern art took a route from parched Arles to the splendor of Fifth Avenue. The Guggenheim Museum, on that same avenue, recently held a showing of work by artist On Kawara (it closed May 3). 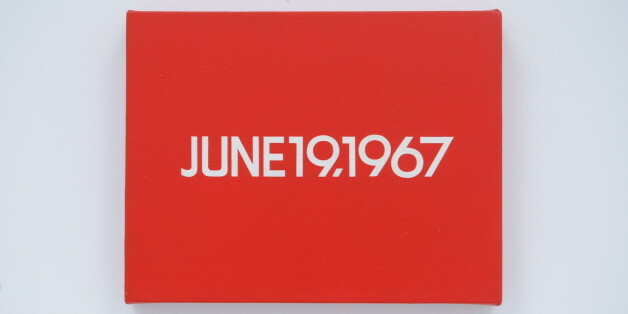 Kawara was born in Japan in 1933 and, at the age of 32, moved to New York where he died in 2014. The modern art he practiced was and is called Conceptualism. He won notoriety for a series of works he started sometime in the mid-1960s. He created one canvas a day with the date painted in simple white letters, usually on a black background, but sometimes on a red. As far as I know, he did it from 1966 until the day he died. Roberta Smith of The New York Times wrote about the Guggenheim show, observing that "the first retrospective of this Conceptual Art giant turns the museum's spiral into a vortex suffused with consciousness of time, life's supreme ruler, in all its quotidian unfoldings." I am not making this up. These were her words. She mentioned "Mr. Kawara's exquisite sense of discipline and craft." Apparently Ms. Smith was referring to his painting letters and numbers by hand -- that's craft -- and his one-painting-every-day regimen -- discipline. Oof! Crafty and disciplined inmates in New York State's prisons make license plates -- stamped with numbers and letters. The deeper meaning of this is known only to the Department of Corrections. The deeper meaning of Kawara's work may be known, I hope, to departments of art and other art institutions, and even to Roberta Smith, but none of them can explain it clearly to the general public. Kawara found his own way to kill time by serving time -- it took a long time, I suppose. 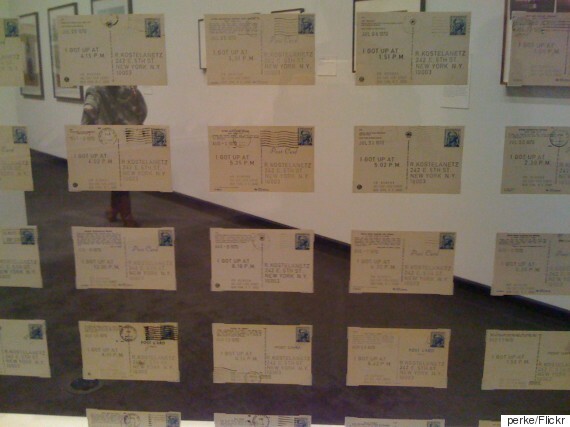 Also on display were Kawara's postcards and telegrams, a lot of them sent to some major players in the art world -- curators, critics, artists. Understandably, his livelihood depended on them. The postcards were invariably inscribed with the message "I got up at ..." and the time. That was usually around 10 a.m. When did Kawara go to bed? Walking from the Guggenheim to the subway along 88th Street, I passed awnings of palatial apartment buildings, also emblazoned with numbers. Doormen were pacing underneath, bored to death -- prisoners of a real vortex of time. Lawrence Weiner, another conceptual artist, is famous for enigmatic sentences and phrases stenciled on walls. He is American-born and, as such, has found an ingenious Yankee method for creating his pieces -- he hires people with machines to do them for him. And he lives happily ever after. I often wonder how the charming, intelligent Mr. Weiner kills time. There are lots of other artists doing time as victims of the conceptual art world -- one paints nothing but vertical stripes, another places metal squares on the floor. Like Simeon on his pillar, they devote their lives to a cultural revolution. And like most cultural revolutions, this one is of questionable value to anyone but its immediate adherents. Modern art today has achieved methods of production lionized by Constructivists during the heyday of the 1920s Modernist movement. They favored the industrial approach -- the best art was that which could be manufactured. So it is today. As Lawrence Weiner famously said, "I do not mind objects, but I do not care to make them." Of course, when the Constructivists were busy manufacturing art, their comrades, the Russian communists, were busy committing atrocities on an epic scale. And it wasn't long before Stalin and Socialist Realism turned Malevich and his followers into victims, too. But in its early days, modern art fervently served the most militant teachings and regimes of the first half of the 20th century. "There are no morals in politics; there is only expedience," said the political revolutionary V.I. Lenin. "Art is what you can get away with," said the cultural revolutionary Andy Warhol. Nowadays, art is an integral part of the capitalist revolution. It has become curated Bohemianism, a cultural revolution perpetuated by financial slight-of-hand: profitable businesses pump money into art non-profits; non-profits promote artists; their work increases in value and creates an art market; businesses speculate in the market and reap profits. Round and round it goes, and all the while the revolution's ascetics -- its artist victims -- serve their time while promising spiritual wonders. We are paying for the sins of the 20th century's ideological movements -- from capitalism's icy laissez-faire to North Korea's quasi-religious juche. All of these promised freedom and happiness. What we have instead, following the destruction of moral and ethical conventions and the rejection of traditional skills, is nothing less than enslavement. Consider Jackson Pollock. That first splash of paint, when the brush was still in the air, must have felt incredibly liberating. But as soon as the paint hit the canvas, Pollock was trapped -- every day for the rest of his life, he was destined to splash, splash, splash, with no way out. His act of defiance ultimately became an unbearably idiotic routine, sentencing him to years of artistic solitary confinement. His pillar wasn't high up in the Syrian clouds; it was lying flat on the ground out in his Long Island studio. But he was constrained to stand on it, nonetheless. The art world demands sacrifices. Cease to do the time, and you are out. I am reminded of a Russian artist who won notoriety in curatorial circles in the West following perestroika. He would go down on all fours at art shows, barking like a dog and biting art connoisseurs' ankles. "That's great," I told him, speaking as an older and more experienced artist. "But the problem is that to keep the art world interested, you will have to bark and bite for the rest of your life." Unfortunately, he switched to some more sensible artistic pursuit and abruptly disappeared from the scene. So whether one paints the date, defaces walls, splatters Rust-Oleum or imitates man's best friend, today's art victimizes all who join its revolution. The history of cultural upheaval is a long and perilous one, and modern art is only one of its recent developments. But those who climb to the top of art's lofty pillar are constrained to stand until they can stand no more, until whatever meaning their rectitude originally had has been lost in a vortex of senseless repetition. The art world can't help but be pleased with the efforts of its victims -- there's money to be made, after all. But there are those of us who watch these developments with increasing alarm, wondering if the art world will ever wake up. The saving grace is that art's machinations generally have little effect on the rest of the globe. That may be the reason that art -- especially today's art -- "is the only human activity that does not lead to killing." Contemporary art has made itself so meaningless that nobody can be bothered to pull the trigger over it. We've decided to make a magazine. In response to the increasingly hermetic, evermore self-referential state of contemporary art, Alex Melamid, Gary Krimershmoys and I have pooled our resources to create Artenol. Why a magazine when print media are headed for the ash heap of history? For that very reason. We're naturally contrarians. Artenol is intended to be a conventional magazine, but it does have several distinctive features that set it apart. First, it has a unique die-cut shape, the only publication we're aware of that does. While this means nothing in itself, it does give the magazine an artsy, sculptural quality; on a more practical level, it also provides a convenient handle for turning pages. In the case of our debut issue, it's Friedrich Nietzsche's moustache that serves that purpose. Each ensuing issue will have a different shape. Another aspect that sets Artenol apart from the multitude of arts magazines on the market today is its content. The stories in Artenol are not by art critics, art historians, art curators, pedagogists and theorists. They are instead by novelists, scientists, theologians, lawyers, poets, plumbers -- writers who come from outside the insular world of contemporary art. This enables Artenol to offer fresh perspectives on the arts, presented in clear and concise prose, free of the jargon-laden insider speak that too often renders art publications indecipherable to today's readers. Our aim is to publish ideas, essays and observations on the arts that are thought-provoking, insightful -- and above all, entertaining. Humor is also an important part of Artenol's mission. Is today's art really as humorless as it appears? We think not. For that reason, we include elements of humor in each issue, leaving it up to the reader to uncover them. 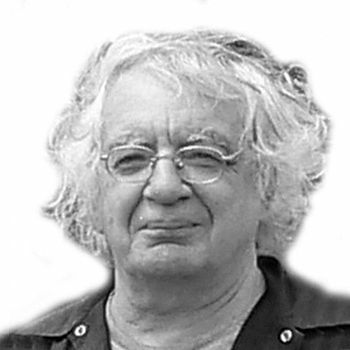 Will Artenol cure the art world of its ills? Of course, and of course not. We leave to our readers to decide. But with its creation, we can say with unrestrained confidence, "Art is dead, long live art!" To learn more about Artenol, visit artenol.org or facebook.com/artenol.